Dictator Adenoid Hynkel has a doppelganger, a poor but kind Jewish barber living in the slums, who one day, is mistaken for Hynkel. For being made at the very height of World War 2, The Great Dictator is an extremely brave film. It could have only been made if enough passion and commitment was present to see it through. Chaplin had this and so much more. He was sure he could make a film for the people of the world suffering from the chaos of the war. Chaplin set out to make fun of perhaps the most evil man of all time, Adolf Hitler. An extremely hard task, but one he was sure to pull off. When the film was released in 1940, it was extremely successful commercially and critically, despite being banned in many countries. Hitler, at that time was becoming the most powerful and dangerous person in the world. Millions of people were scared of offending him. So, when a film like The Great Dictator was released; one that made Hitler look like a joke of a man, it was a huge statement. One that stood up for all that was still good in the world. Much had been said previously about the similar appearances of both Chaplin and Hitler. They were two people on opposite ends of the spectrum. They were in fact born on the same year, of the same month, in the same week. However, one was a man who gave hope and laughter to millions of people, and one was a monster that would be the cause of millions of innocent deaths. The Nazis even published statements about Chaplin, calling him an “evil Jewish clown”. This was partly the reason Chaplin decided to fight back, and he did so in the way he knew best, by making one magnificent film. The Great Dictator was above all, a statement of freedom and democracy at a harsh and frightening time in history. It was a lone voice in speaking out against a big bully. We see Chaplin’s version of Hitler, “Adenoid Hynkel”. This man constantly proves to be hollow and empty, as someone who just wants the entire world, nothing more and nothing less. He is a man we could only feel hatred towards and someone to be mocked. Even as Hynkel gives an angry and aggressive speech to a huge audience, he looks ridiculous. His hollow anger even results in microphones bending away from him and spinning around like cartoons. He constantly trips or is knocked over like a child by bigger people. At one point he even struggles to pull apart a plate of cooked spaghetti with his hands, showing just how weak he really is. The films cartoon portray of this Hitler-like dictator may seem wrong or even offensive to some people affected by the war. However, I feel certain people miss the point with the film. Sometimes the best way to get by in hard times is with laughter. Laughter can be the most powerful weapon humans possess. Chaplin understood this, as he had already shown in films such as The Gold Rush or Modern Times. Chaplin connected comedy and tragedy very closely, and was the master at proving that one could defeat the other. Chaplin used comedy in The Great Dictator to genius effect, by making an extremely evil man, look just a little less intimidating. This was certain to have helped the spirits of millions around the world. 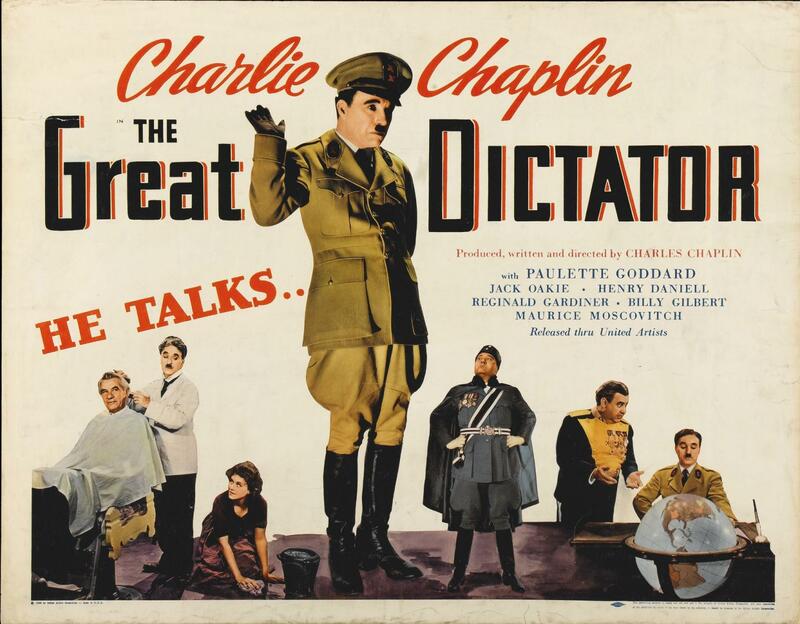 One important element that has been criticised in The Great Dictator is the films final speech by Chaplin. Here, he steps out of his character in the film, and addresses the world as a doppelganger of Hynkel, but as Chaplin. He speaks passionately about world freedom, and the bitterness of dictators. He encourages soldiers to take stand. To not be treated as machines, but as men. Critics have said that this step out of character is confusing and disorientating. But why not end a film of such importance in a praise of freedom? Why not speak from the heart at such a hopeless time in history? The speech Chaplin gives is beautiful and passionate. Love burns off his every word. 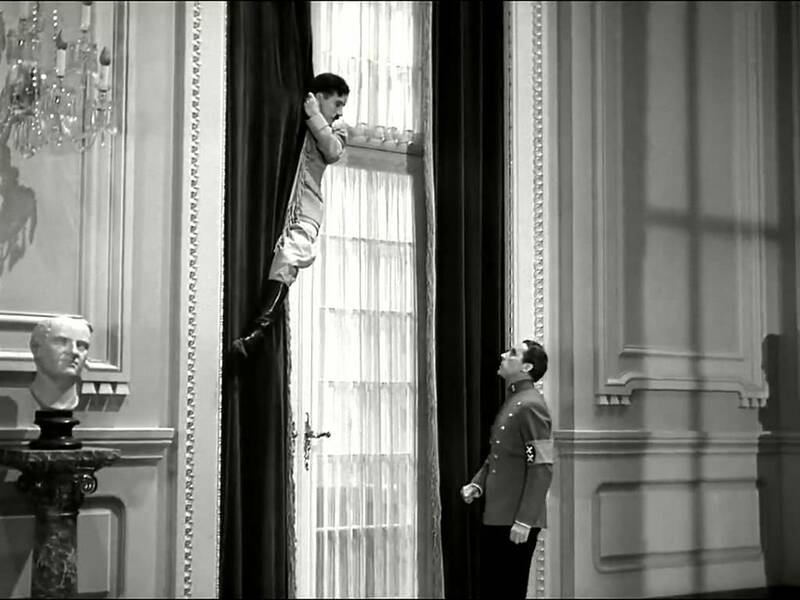 The film is also home to some well-written characters, and some classic slapstick set pieces. The film’s music is both touchingly sad and brightly comical; it is well worth watching the film just to hear. There are some lovely tracking shots, and many wonderfully detailed set designs. The black and white photography is beautiful to see alongside its silent-era styled editing and pacing. 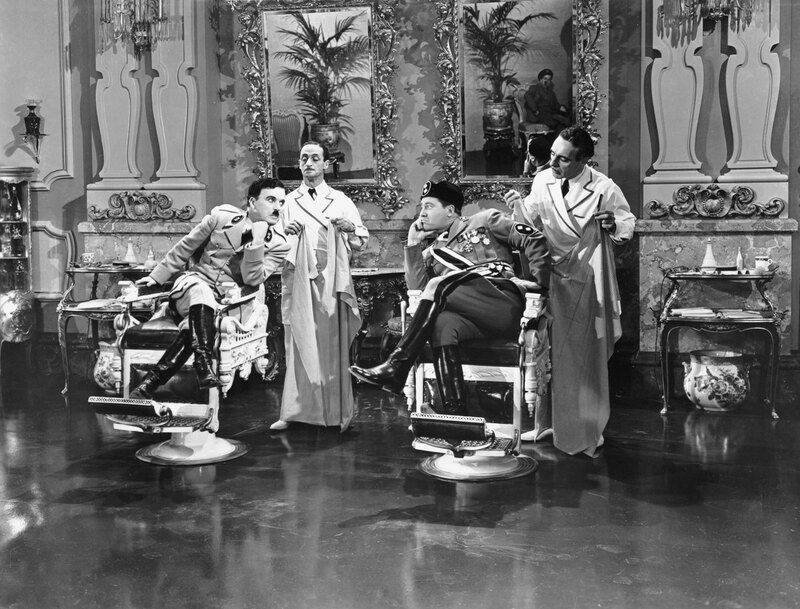 The Great Dictator is a great place to start if you wish to explore Chaplin’s filmography as a director. He clearly places his heart and soul into every process of his filmmaking. Even by today’s global situation, the film’s message is relevant. 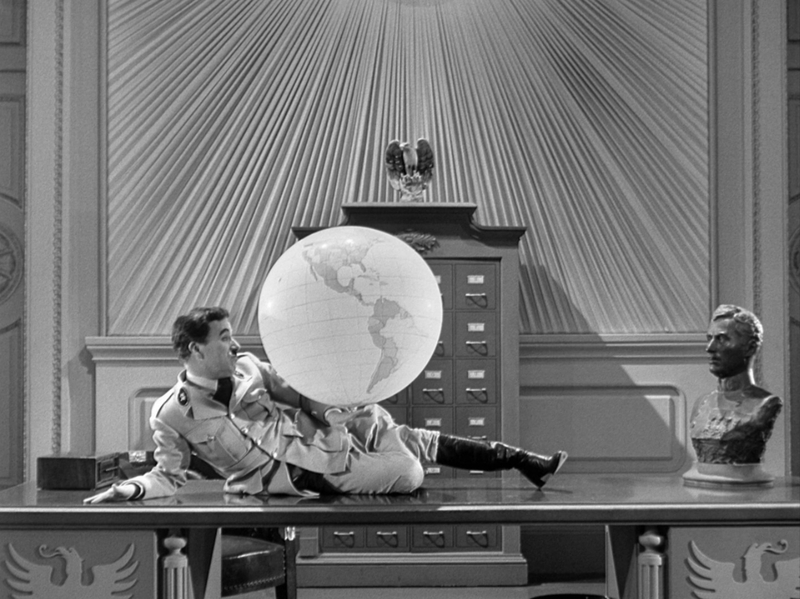 The Great Dictator shows that sometimes, the only way to battle evil in the world is to laugh at it. It may prove to not change much physically; however, it could feel your spirit with the necessary hope required to carry on fighting in life. A timeless piece that may have been made about Hitler, but applies equally to any ridiculous authoritarian figure. One of Chaplin’s best works. Thanks for the review. One of my favourite films of all time. To me one of the greatest film ever made, if not the best,it does rank in my top five, maybe three, un chef d’oeuvre…and it is true, treat something so evil with humour is one nice way to answer monstruosity. Haven’t watched this one yet. 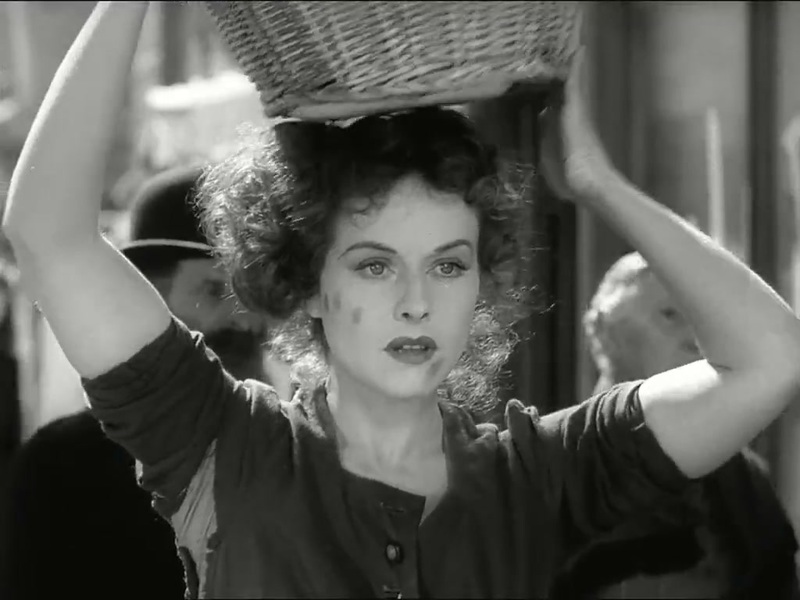 I just finally took my first dip into Chaplin’s oeuvre with The Gold Rush. Brilliant movie. I’m looking forward to exploring the rest of his films, especially this one. Excellent post. I aam dealing with some of these issues as well.. I agree with you in every way. This is an excellent film, one that oozes with the love that Chaplin had for the craft of film making and for comedy. I think that the premise of the piece is not only brave, but heroic. I know a little bit about dictatorships, and I am well aware of the power that art can have in difficult times. Film is escapism after all. I also agree with you in terms of the final scene. Critics are right to point out that he breaks character, and that it may very well be disorienting. However, Chaplin’s intentions were clear. He did not intend to paint a faithful picture of a real man, but a mockery of one. It is, by design, not meant to be a strict character study, and the liberties he took ridiculing Hitler, shed upon the last scene where he chooses to liberate himself from his role to deliver a beautiful message about freedom and hope. This is, in fact, one of my favorite moments in film, and one I intend to talk about in great detail sooner or later in my blog. His speech at the end of this movie is so fabulous… love it!!! !